I've written before about the use of branded cartoon characters on government websites and the ways that this rhetorical strategy shortchanges the information literacy of our children. Perhaps the most ludicrous use of online dumbing down has taken place at the Ready.gov kids website produced by the Department of Homeland Security, which made the symbol of fun-filled family safety a pride of mountain lions. (This is an odd choice to Southern Californians who know that mountain lions in the foothills will sometimes snack on a particularly tasty mountain biker and that, since they are lion-sized at all, these encounters can be genuinely terrifying. Just when I thought that they couldn't make the DHS site for children any worse or any more remote from the school reports that are more likely to bring them to a government website, they showed me that vapid anthropomorphic entertainments were only the beginning. 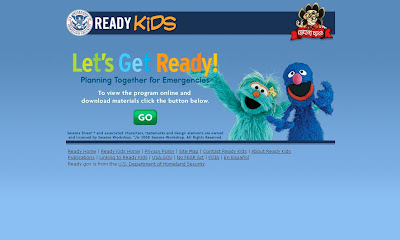 I was raised on Sesame Street, as were my kids, but I feel that the Sesame Street-themed Let's Get Ready is particularly inappropriate in pushing commercial content on a government website by littering the page with trademark legalese and copyright symbols. 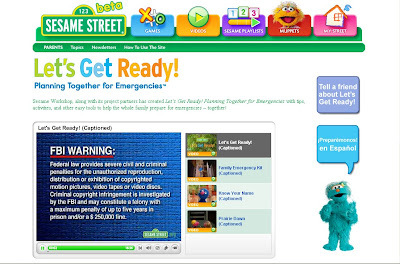 Children who follow the link to the main site are treated to a lengthy FBI warning on the very first embedded video against copying what would normally be information about public safety in the public domain.